Maryland's top lawmakers, including Governor Larry Hogan, say Delegate Mary Ann Lisanti needs to resign after using a racial slur in reference to a district in Prince George's County, which is predominantly African-American. (WMAR) — Maryland's top lawmakers, including Governor Larry Hogan, say Delegate Mary Ann Lisanti needs to resign after using a racial slur in reference to a district in Prince George's County, which is predominantly African-American. Del. 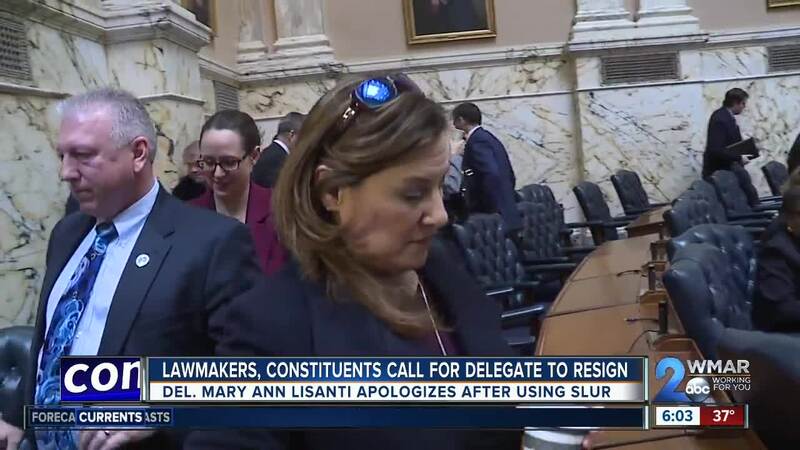 Mary Ann Lisanti (D) apologized to the leaders of the Legislative Black Caucus of Maryland and the House Democratic Caucus for her use of the n-word. "I deeply apologize to the citizens of my district, people of Maryland, all of my colleagues in the Maryland General Assembly and everyone reading this for my word choice several weeks ago. I am sickened that a word that is not in my vocabulary came out of my mouth. It does not represent my belief system, my life’s work or what is my heart. Last evening I met with the Legislative Black Caucus to express my deepest regret for the pain I have caused my colleagues in the General Assembly and repent. This morning, I expressed the same to the entire Democratic Caucus. Earlier today, I met with House Speaker Busch and agreed to step down from my leadership position. I also agreed to participate in sensitivity training. I understand that the use of inappropriate and insensitive language is not acceptable under any circumstance. I am sorry for the hurt I have caused and will do everything I can to help heal that pain and regain the trust of my colleagues and constituents. I pray for forgiveness. " According to the Washington Post, Del. Lisanti allegedly used the slur to refer to Prince George's County during an after-hours gathering at an Annapolis cigar bar. Legislative Black Caucus chair Del. Darryl Barnes (D- Prince George's) said that kind of behavior won't be tolerated. "Racism is just as prevalent today as it was in 1950. It's just been more sugar coated than it has been back then. So what we're trying to do is make sure, here in the state of Maryland, here in the House of Delegates, that it is known that it is not tolerated and that we will do all that we possibly can that should this ever happen again that there's a process in place." Del. Barnes said that in this case Del. Lisanti will be dealt with swiftly. Del. Lisanti is no longer chair of the Unemployment Insurance Subcommittee and will take sensitivity training. "There is no member of the House of Delegates that is less than or inferior to any other member. As Speaker, I will demand that every member treat each other with the respect and dignity that they deserve – and also treat the citizens of Maryland that way. I hope that through the sensitivity training that Delegate Lisanti has agreed to and the help of her colleagues, she will develop a greater understanding of the impact that she has had on her fellow legislators and the entire House of Delegates. Like anyone who has made a mistake, she has the opportunity for redemption – but it is her responsibility to do so and earn back the trust of her colleagues."